Meg, aka CTW Messy Meg, is a beautiful 5 year old red brindle female born May 12, 2012. Her sire is CTW Plaza Rio and her dam is CTW Mystify. 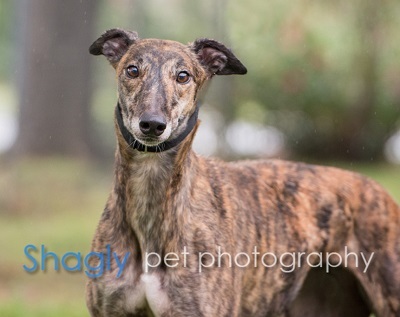 Meg's racing career consists of 128 races per Greyhound-Data.com, starting at Gulf Greyhound Park in La Marque, TX and finishing her last race on May 6, 2017, at Birmingham, AL. It is not known at this time if Meg is cat or small animal tolerant.